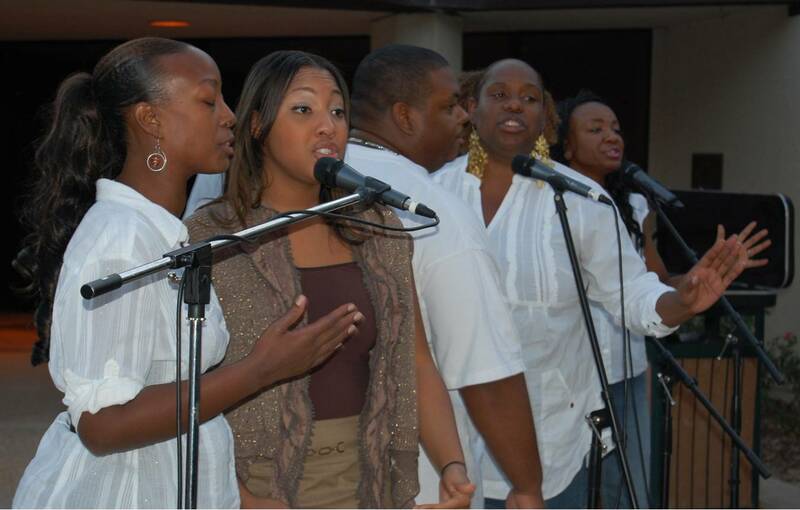 The Praise Team from Living Stone Cathedral of Worship leads the crowd in song. 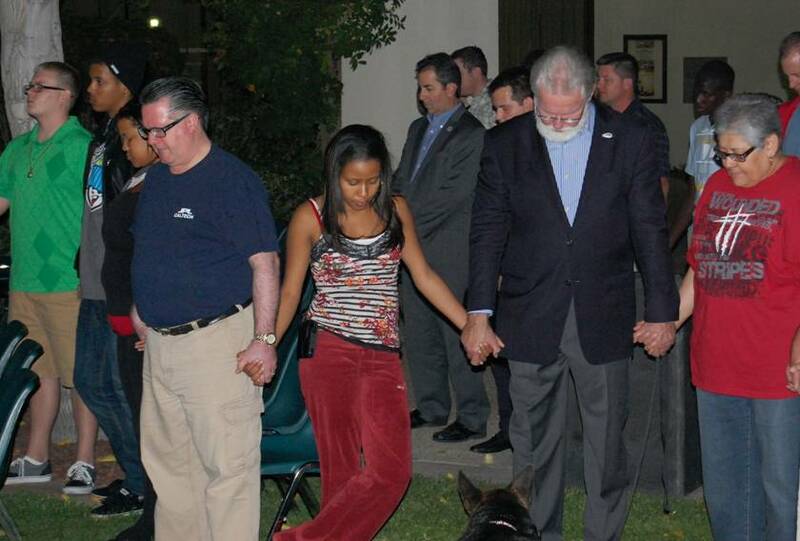 Mayor R. Rex Parris holds hands with residents as prayers are offered. LANCASTER – A crowd of more than 100 gathered in front of Lancaster City Hall Thursday night. 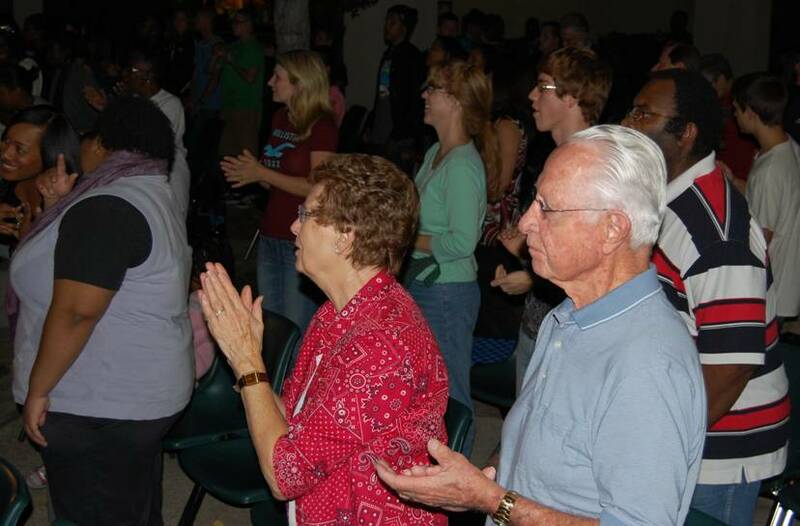 Many clapped their hands, some shook tambourines, and others danced with arms outstretched as the Praise Team from Living Stone Cathedral of Worship lead the lively group in songs of praise and worship. The event, dubbed the Night of Prayer, was part of a mission to bring prayer back into the community, said organizers. “Right here in the middle of the City, we want everybody to know we’re going to be praying all year long,” said Bishop Henry Hearns. Several in the crowd held their arms outstretched as they sang praise songs. “With the things that are going on – the law suits and what have you — all kinds of things are going on…What we’re saying is God can turn it around,” he continued. 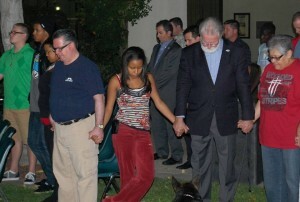 Kaylan Perkins leads the group in prayer as Bishop Hearns looks on. * Antelope Valley as a whole. 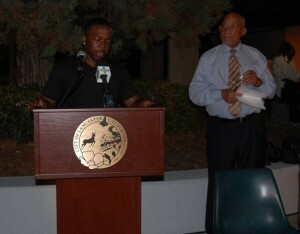 Hearns told the crowd that all men and women should stand up and fight for their right to pray and worship God. 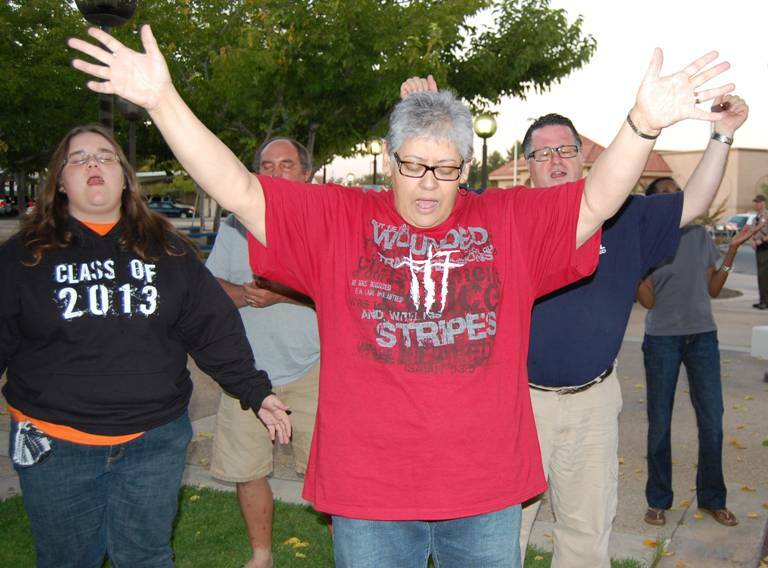 More than 100 came out to pray at City Hall Thursday. The Mayor’s Prayer Breakfast Committee, a non-denominational, non-profit organization of Christian businesses and professionals, came together in 1992 to plan Lancaster’s first Mayor’s Prayer Breakfast, held every year on the National Day of Prayer in May. The Committee is now working to bring the community together to pray, joining forces with local churches, including Oasis Christian Church, Desert Vineyard, Grace Chapel, and Living Stone Cathedral. For more information, visit www.praylancaster.com. See more pictures from the Night of Prayer on our facebook page here. 12 comments for "A Night of Prayer for Lancaster"
Note: Of course completely missing from the event was Paul Chappell, Sherry Marquez, and all the other mindless followers from LBC. Paul will tell you himself that he can not fellowship with any other “Christians” in the valley for any reason….unless they are independent baptists just like him. Just ask him. Scary stuff, considering how much behind the scenes pull he has in Lancaster city government. They believe that only other Independent Fundamental Baptists (IFB) are “true Christians”, which is the hallmark of a cult. Yeah, I know that’s a harsh thing to say, but there’s really no other way to put it. Cult groups are also known to hide child and other abusers in their midst and handle such matters in-house without government involvement. ABC 20/20 recently blew the whistle on IFB churches just like LBC, who are doing exactly that. My question is…If he can’t even pray with other Christians in the valley, why does he feel the need to tap into local government so deeply and put staff members on the city council and planning commissions? Is it all simply about getting free sewer and water lines out to 40th east and J build the massive compound? What is it? I don’t think the Mayor is a faithful member, but I do think that there probably is a “relationship of convenience” come election time. Anyway, although I think LBC’s “theology” (to be generous) is way off and cultish, they aren’t necessarily bad people. Brainwashed? Hell Yes! But they have manners and are always polite, which is OK with me. Too bad more churches out here don’t teach their parishioners the virtues of having good manners. If they did, the Antelope Valley would be nicer, socially. It’s called buying votes…by church. As annoying as Lancaster is as a neighboring city, it provides such a nice contrast to living in Palmdale, Quart Hill and other surrounding areas in the valley. Whenever I read the stuff that goes on in Lancaster I’m always thankful I live in Palmdale and that I didn’t make a big mistake moving here in 1990 by buying a house north of N.